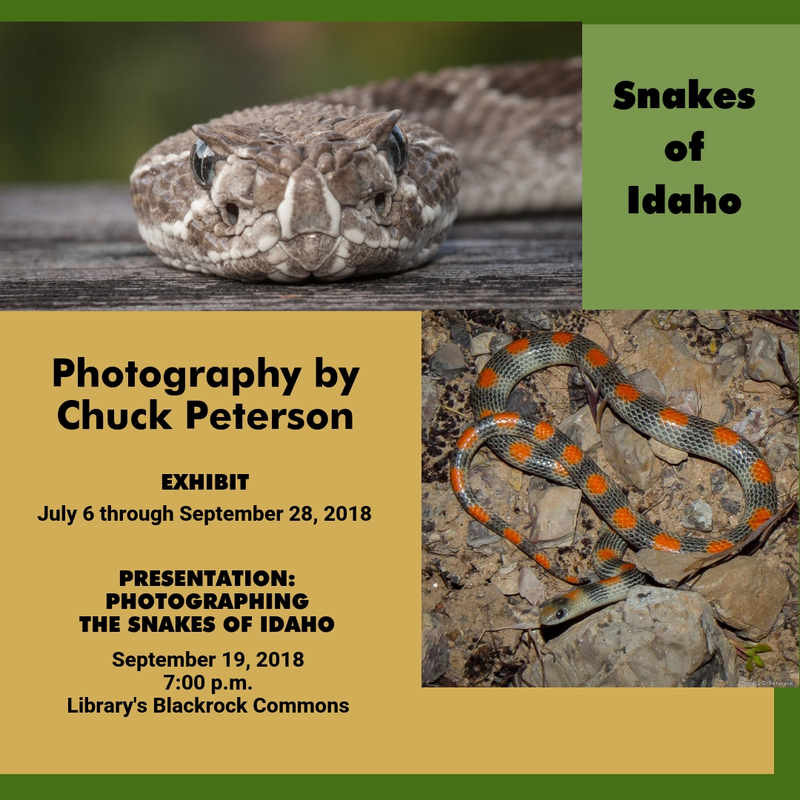 The Eli M. Oboler Library at Idaho State University, Pocatello, is pleased to announce an exhibit of photography by ISU biology professor Dr. Chuck Peterson. The exhibit, “Snakes of Idaho,” will be on display from July 6 through September 28, 2018, in the Library’s 1st floor art exhibit area. Chuck Peterson is a Professor of Zoology in the Department of Biological Sciences. Peterson's teaching responsibilities at ISU include Introductory Biology, General Ecology, Herpetology, and Photographic Applications in Ecology. Since coming to ISU in 1988, Dr. Peterson has had five Ph.D., four DA, and 18 Master's students complete their degrees under his supervision. He has conducted herpetological training sessions for many agencies and corporations. Peterson's research interests include the ecology and conservation biology of amphibians and reptiles. He has authored or coauthored 2 books, 22 book chapters, 31 journal articles, and numerous notes and technical reports on topics such as temperature and water relationships, movements, habitat and distribution, the effects of various disturbances on populations, and developing techniques for surveying and monitoring populations. Much of his work has focused on reptile populations on Idaho's Snake River Plain and on amphibian populations in the Greater Yellowstone Ecosystem. Peterson received the Outstanding Herpetologist award from the Idaho Herpetological Society in 1997, the Professional Wildlifer Award from the Idaho Chapter of the Wildlife Society in 1998, ISU outstanding researcher awards in 1999 and 2002, the ISU distinguished public service award in 2001, the Jeremy Bigelow Award for outstanding service to scientific research from the ISU Chapter of the Society of Sigma Xi in 2009, and the Northwest Partners in Amphibian and Reptile Conservation Luminary Award in 2016. Peterson is also an avid nature photographer. This informative exhibit can be viewed whenever the library is open; check isu.libcal.com/hours/ for a current list. For more information about art in the Oboler Library, please contact Kristi Austin at the Oboler Library: austkris@isu.edu and (208) 282-4073. Chuck Peterson may be reached via email at petechar@isu.edu. The Oboler Library is located on the corner of 9th and Martin Luther King, Jr. Way, at 850 S. 9th Avenue in Pocatello, ID.